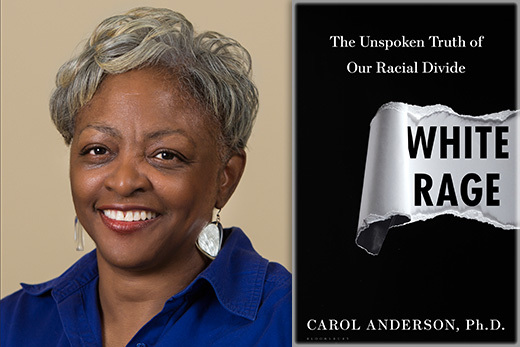 Emory historian Carol Anderson received the National Book Critics Circle Award for criticism for her book "White Rage: The Unspoken Truth of Our Racial Divide," lauded as "a searing critique of white America’s systematic resistance to African American advancement." Also memorable was a session where all the nominees gave a three-minute reading from their work. “Being in a space where the power of great writing is so evident and the clarity of these engaging ideas are cascading over each other — it was so empowering and uplifting being there,” she says. Perhaps most gratifying to Anderson is that the book has been heard by a wide range of readers. “A lot of times, I’ll get emails like the one saying ‘I’m a 70-year-old white man in St. Louis. I knew something was wrong, but I didn’t know what it was. Thank you for writing ‘White Rage,’" she says. She lists Brett Gadsden of African American Studies, Sherman James of Epidemiology, and Dorothy Brown of Emory Law as the first readers of her manuscript for “White Rage.” “They turned those chapters around so quickly with fabulous comments and suggestions,” she says. “From the colleagues who read the manuscript, to the research assistants that I had, both undergrad and grad students, and the fabulous resources at the Rose Library, I can say that Emory was absolutely essential for ‘White Rage’ becoming ‘White Rage,’” she says. Although Anderson was the recipient of several prestigious awards and citations for “Eyes Off the Prize,” “White Rage” is her first trade book, and the first time she has ever been in contention for an NBCC award. “White Rage” also is a New York Times bestseller and a New York Times Editor’s Pick for July 2016. Founded in 1974, the National Book Critics Circle Awards are given annually to honor outstanding writing and to foster a national conversation about reading, criticism and literature. The awards are open to any book published in the United States in English (including translations). The NBCC comprises more than 700 critics and editors from leading newspapers, magazines and online publications. See the full list of recipients of this year’s NBCC awards.